Gene Ornstead, director of product marketing for digital signage at ViewSonic, headquartered in Brea, California, often encourages newcomers to digital signage to start out small: in a deployment of just several screens, for example, users can load new content onto each display manually, via a thumb drive. “That removes the headache of network configuration if you’re not ready to go there,” he said. North Carolina State University James B. Hunt Library features Planar’s Clarity Matrix video wall. At the same time, as the deployment grows, networked systems are a better choice because they enable users to make updates, or perform management tasks, remotely. “If you can control multiple monitors from one point, that is a time and money-saver, because you don’t have to send a person around to do things [manually],” said Michael Cronan, manager, digital signage solutions strategy and development at Panasonic, headquartered in Newark, New Jersey. This leads to another question: do you invest in an on-premise solution, or should you seek out a cloud-based solution? For Cronan, this depends on how open the IT department is to the cloud in general. “A lot of companies out there, from a security standpoint, don’t want anything touching the outside world. They’re willing to set up internal networks and things are still LAN-based, but not touching the cloud.” While this presents some limitations, if the enterprise has the LAN and WAN structure in place, it generally isn’t a problem. However, if those updating the systems are always on-the-go, a cloud-based solution provides added flexibility. Analyst, author, & consultant, Lyle Bunn Ornstead points out that software is one area where organizations run into trouble––that is, if they made the wrong choice to begin with. “One thing that’s important—and prevents a lot Analyst, author, & consultant, Lyle Bunn of grief—is don’t switch around software. Try to stabilize on one that you can grow with,” he said. This means that before purchasing software, you need to consider how many screens you want to run initially, as well as how many screens you may scale up to in the future. Gene Ornstead, director of product marketing for digital signage, ViewSonic One popular way organizations get the most out of their digital signage investments is to transform it into a revenue source. We see this in airports all the time, where signage features advertising from third-party brands (such as those sold in duty-free shops, for example), as well as messaging that promotes the airport itself. This trend has trickled down to Corporate America, Bunn noted: “We’re seeing much more of a hybrid [model] where that corporate communication network wants to profile its suppliers or partners, and are happy to take their marketing dollars in order to do that,” while still dedicating time slots to promote their own brands. Indeed, this helps soften the blow of a technology investment, however you need to be certain, up front, that your system can handle the required workflow. It’s also necessary for stakeholders to establish what content is appropriate for display. If you’re a national defense agency, it may seem completely logical to sell advertising to the manufacturer of the aircraft your department utilizes. But actually, that’s a big red flag: “That would appear to suggest a bias in favor of one aircraft manufacturer over another, and so would be an unacceptable kind of advertising for a government department,” Bunn explained. He also points out that if you do wish to incur ad revenue from your digital signage, you either need to appoint an internal ad salesperson, or contract ad sales out to a specialized firm. DO THE MATH: IS A CONSULTANT WORTH IT? ViewSonic’s ePoster digital signage solutions installed in a variety of applications. More organizations hope to leverage digital signage for new, sustainable revenue sources. 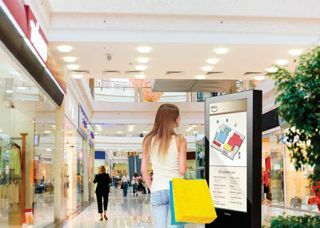 Because digital signage has the potential to touch many different areas of an organization—AV/IT, marketing, human resources, operations, and even facilities management—the needs and desires of the stakeholders involved are sometimes opposing. What’s more, each department tends to speak a different language. While Bunn acknowledges the shameless plug when he urges enterprises to seek out a consultant to assist in making the right choices, it’s a common assertion that investing in an objective, outside perspective might just save a client some money down the road. “Sometimes there’s value in getting somebody in there who can speak everybody’s language and help everyone understand the implications of the decision that they have to make, or that will be made by somebody else,” he said. A good consultant will also help decision-makers weigh issues such as upfront costs versus ongoing expenses throughout the duration of the system’s lifecycle, along with what level of functionality the organization actually needs.